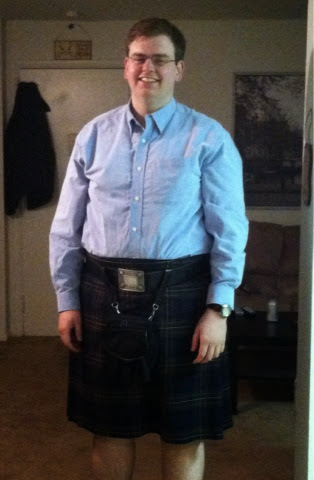 Saturday night, I broke out the kilt for the first time since September. I went to my synagogue for Purim services. Part of the tradition is that we wear costumes. There was a wide assortment of costumes, both adults and kids. Everything from a Biker Rabbi to a Pirate, with many bibilcal figures in between. I was Oy-Rish - to honor my shared Irish and Jewish heritage. Conveniently, it was also 2 days before St. Patricks Day, so when myself and my significant other stopped for food after services, no one batted an eye at the kilt. She's already warned me that she's got reservations about me doing KTKC this fall... so it was good that she got to see that people can ignore men in unbifurcated trousers.